To analyze Chevrolet’s second-generation Camaro, introduced for the 1970 model year, the bowtie called upon the executive director of GM design for Chevrolet trucks and global architecture, Ken Parkinson. Chevrolet awarded the Camaro with its own dedicated architecture for its second iteration, giving General Motors designers “freedom to create pure expression,” Parkinson says. Other notable design features on the second-gen Camaro include the hood design, which Parkinson says helped to exaggerate the power of the V8 engine and the “simple” and “beautiful” Chevrolet signature dual taillights. 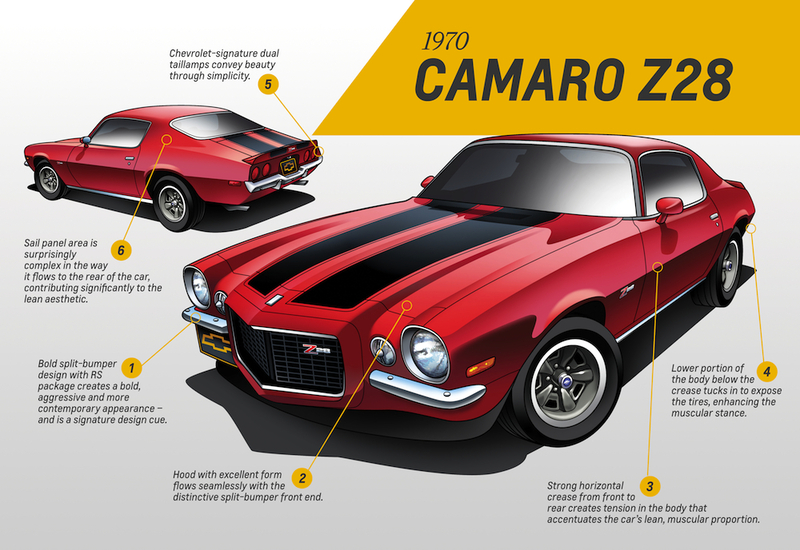 The design of the Camaro would begin to change dramatically after 1974, appearing more and more modern until the third-generation of the car was introduced in 1982.